CatPaint lets you add cats to your photos. For some reason. Are your photographs suffering from a decided feline shortage? There's a cat for that. 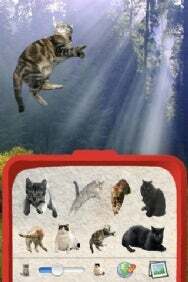 Davander Mobile has launched CatPaint, an app that lets you add cuteness—in feline form—to any photo on your iPhone or iPod touch. You grab a photo, choose a kitten, and then tap to place it anywhere within the image. CatPaint lets you e-mail your be-kittened masterpieces to your soon-to-be-ex-friends, or just save them to your camera roll in private shame. The app costs $1, and is available now in the App Store; it works with any iPhone or iPod touch running iPhone OS 3.1.2 or later.